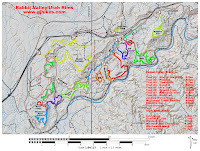 The Western Rim Trail is located in the BLM Utah Rims Area near the Colorado/Utah border west of Grand Junction, Colorado. Most people access the trail from the Rabbit Valley Area on the Colorado side of the border. Popularity of the Western Rim Trail makes it one of the must ride routes in the area by both mountain bikers and dirt bikes. Views of the Colorado River coursing through the western portion of Ruby Canyon and the many colorful sandstone cliffs provide an abundance of gorgeous scenery to the pleasure of anyone that rides or hikes the trail. 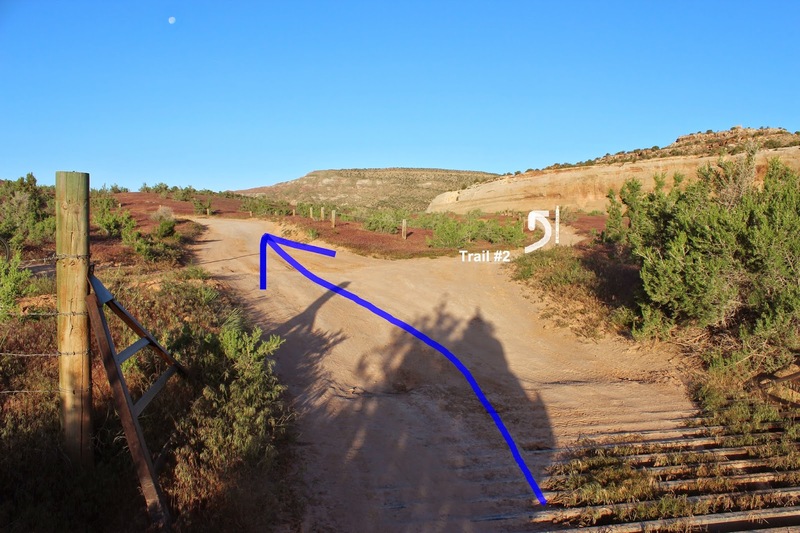 Many people access the Western Rim trail from the Mountain Bike Staging Area near the interstate by using Trail #2 as a connector route. The total round trip distance for that comes out around 21.5 miles. This post begins at the McDonald Creek trailhead and follows the Kokopelli Trail and that cuts the distance down to 14 miles. 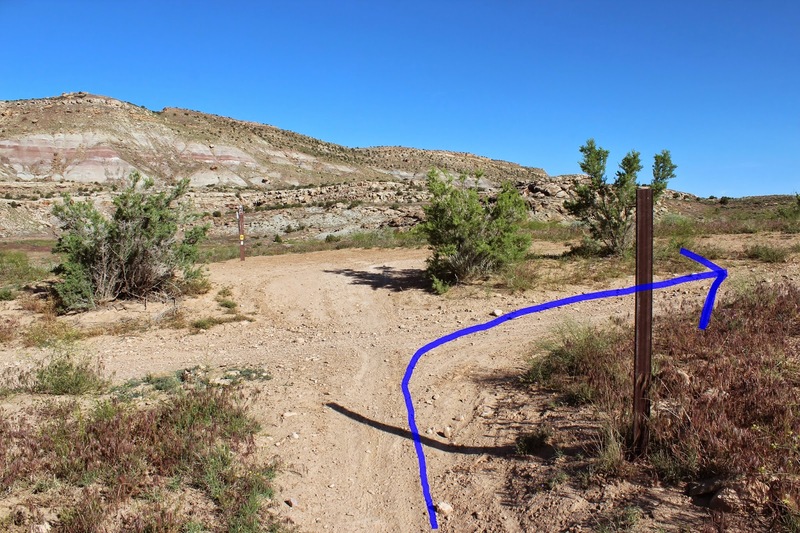 We have seen passenger cars that were able to make it to this trailhead in dry weather by taking the route through the wash.
From the trailhead get back out on the road, which is also the Kokopelli Trail, and go left. After crossing a wash and cattleguard you have the option of getting on the remainder of Trail #2 or continuing straight ahead on the Kokopelli Trail as we did. It is nice having options to create a variety of experiences. Trail #2 is a lot of fun but the Kokopelli route is shorter and faster. After passing through the Castle Rocks area there are 4 roads that branch off on the left. The first 2 lead to the Knowles Canyon Overlook and Campground. The next road leads a short distance to a nice campsite and the last road is the beginning of Trail #6. The Kokopelli route is well signed at present making it easy to find your way. The trail crosses the Colorado/Utah border after about 1.8 miles having gained just over 300 feet of elevation up to this point. For anyone wanting to drive this far a high clearance 4-wheel drive vehicle is a must. The loop begins at 2.5 miles. The customary direction is to go to the left at this point and travel the loop in the clockwise direction. The loop begins as a double track that makes a split after a short distance where both branches reconnect after 100 feet or so. 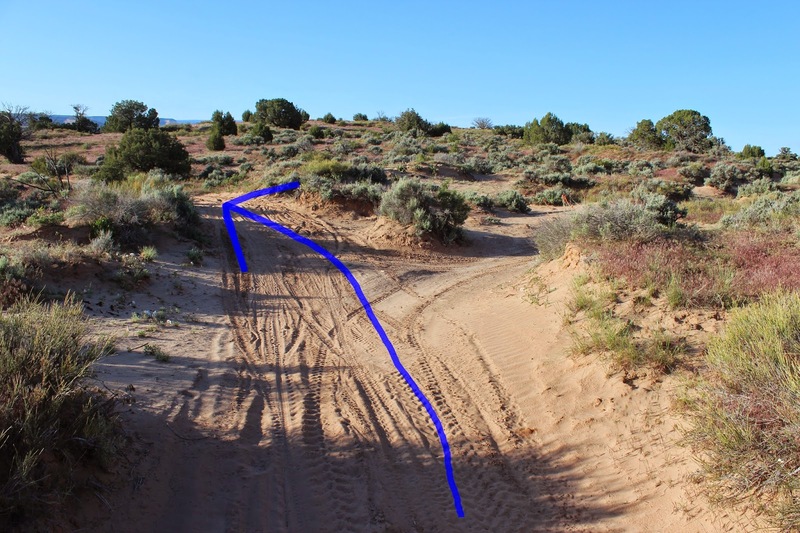 Be sure to stay left at the next fork and follow the trail through some loose powdery sand to where it begins the single track that drops over the edge and picks up the bench area below that it follows around the rim. 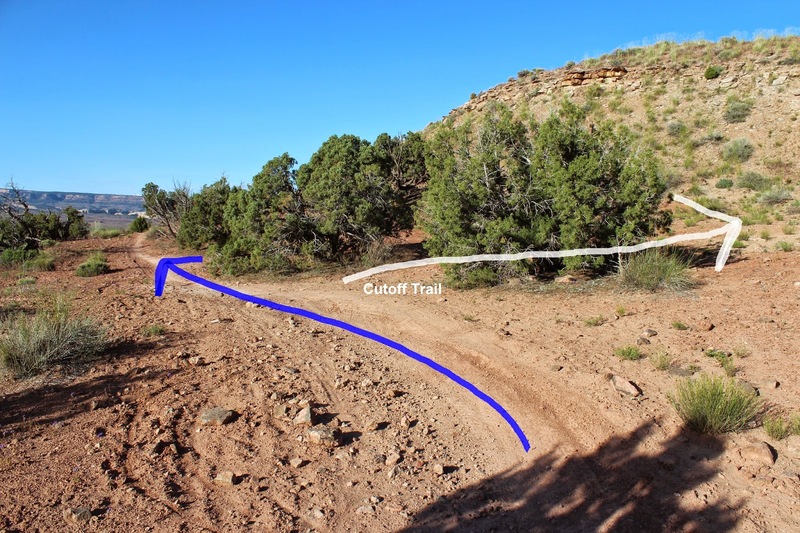 The trail along the rim varies between hard packed dirt to slickrock. Except for one very short section the trail is set back far enough from the edge that there is very little exposure. Large boulders and a few bushes add to the fun as the trail snakes its way around the rim. 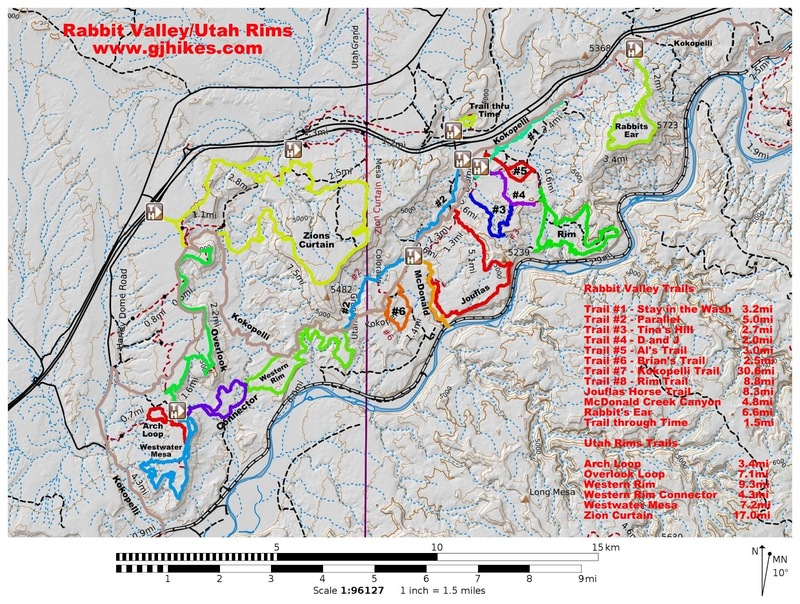 Right around 4.3 miles there is a cutoff trail that climbs the hillside, passes through a narrow slot, and joins another trail that travels around the upper rim area. 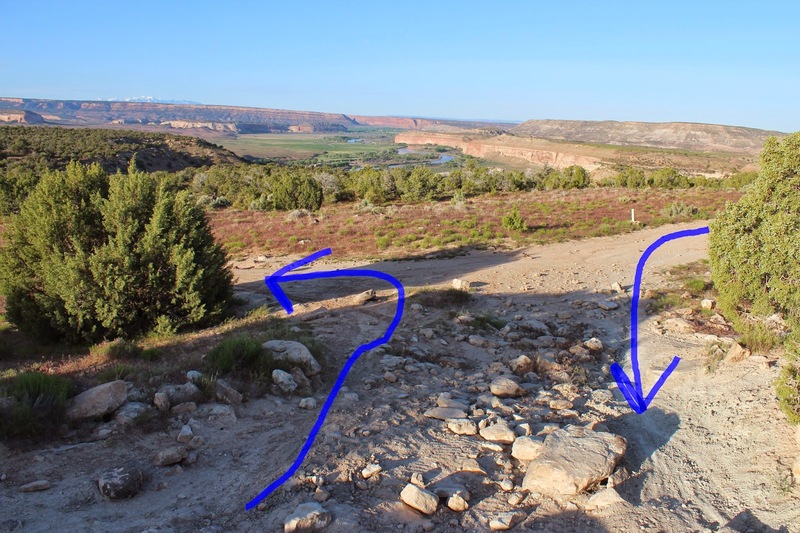 By following the trail to the left you can come back out on the Kokopelli Trail. The cutoff might come in handy if for some reason a person needed to bail on the Western Rim trail. We have ridden the trail above the rim. It is pretty primitive and looks totally unofficial. There are some impressive views of the little side canyons below the rim. This slickrock area is like riding around the rim of a bowl. At the west end of the route the trail climbs several steep hills. From the higher vantage point the views opens up of the La Sal Mountains, Colorado River and distant canyons. The trail loops away from the rim where it drops through several washes and over a few hills to where it comes out on a double track around 8.6 miles from where we started out. At this point we follow the road to the right and rejoin the Kokopelli Trail after a short distance. From a few places along the Kokopelli Trail you can look back down on the Western Rim Trail and savor the experience once again. The 2.5 miles of downhill to finish up with brings the whole thing to a quick and pleasurable end. Over an inch of rain had fallen in the previous week but the only indication was a puddle of water in the parking lot. The Rabbit Valley area can make water disappear like some sort of super sponge. We have seen a picture of a pickup buried in the mud but we aren't sure where it was taken. As far as the Western Rim trail goes, like we said, it is the 'must ride' trail in the area. Our map lists the trail as 'Advanced' but that is probably due to the distance and not the technicality of the trail. We rode it without any trouble and we consider ourselves more at the beginner end of the skill level. If you would like to see it for yourself then all you have to do is grab your bike or 'Take a hike'.